4x8 inch remote controller and 4x4 inch external speaker. Large LCD with dot matrix characters. Channel and Group dials offer easy channel selection and operation. Powerful 150W(PEP) output. 0.5 to 29.9999MHz wideband receiver. DIN and RS-232C connectors for external equipment. 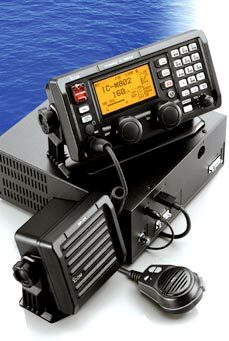 NMEA 0183 interface included. 1035 ITU, 160 programmable and 160 e-mail channels are available. Built-in 2-tone alarm function.